For more than three thousand years, the Persian garden has been a focus of Iran’s national imagination, influencing its art, literature, and even religion. The Persian garden’s inspirational role has, however, extended far beyond the land of its origin; its precepts have exerted a profound influence on garden design around the world. 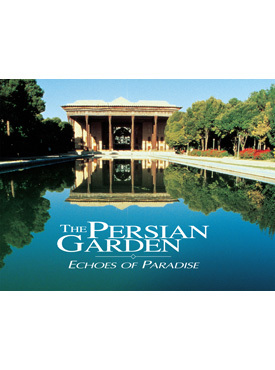 The Persian Garden: Echoes of Paradise chronicles the history of the Persian garden, from the magnificent sanctuaries and hunting parks of fifth-century b.c. Persepolis to the magical nightingale gardens of nineteenth-century Tehran. All were seen as a kind of earthly paradise (the English word paradise has its roots in the old Persian word pairi-daeza meaning a “walled space”). To an astonishing extent, that vision seems justified. Mehdi Khonsari was born in Tehran. He studied photography at the School of Visual Arts in New York. In 1986 he co-authored with his wife, Minouch Yavari, Espace Persan, a book on traditional architecture in Iran. He also co-authored The Persian Bazaar: Veiled Space of Desire. M. Reza Moghtader was born in Tehran in 1931 and received his architecture degree in Paris in 1956. From 1958 to 1981 he practiced as an architect in Iran where some of his designs include: the Master Plan for the City of Tabriz, The Shiraz University Complex, and The Tehran University Faculties of Theology and Economic Science. Since 1981 he has been living in Paris where he researches and practices architecture. Minouch Yavari was born in Tehran. She received her architecture degree in Paris and has worked as an architect since 1984 in Tehran, and then later in France. In 1986 she co-authored with her husband, Mehdi Khansari, Espace Persan, a book on traditional architecture in Iran. She also co-authored The Persian Bazaar: Veiled Space of Desire.